Religion and its dogma are ex-clusive. Carole: Religion is a necessary evil. Always necessary, sometimes evil. Generally, I’m a fan. If only the people involved could be nicer sometimes. Felipe: The Bible teaches that there are 2 categories of people that will go to heaven: Safe & Saved. Safe are those that die before they reach the age of accountability, such as babies and children, and also those souls that are mentally incompetent and unable to discern the Gospel at any age. So, according to the Bible, the infant in the casket that you witnessed went home to be with Jesus for eternity. Saved are those that have heard the Gospel and accepted the FREE gift of salvation, paid for on the cross by the Lord Jesus Christ. Religions are man-made cults that lead more people to Hell than anything else. Satan’s favorite word is religion. Religion is people working at following a myriad of man-made rules in hope of doing good enough works to earn their way into Heaven. The false doctrines of Catholicism perpetuate the lies of Mary worship, transubstantiation, purgatory, prayer for the dead, confession to a priest, idol worship (religious statutes and rosaries) and more are not found anywhere in the Bible. Whereas, Christianity is a personal relationship with the Lord Jesus Christ, no rituals, works or other man-made requirements. Many thanks, Jeff. You clearly are better versed in these things than I am. Being raised by a couple of Godless socialists, as I was, I was never given any sort of religious training as a child. I have never joined a church, never been Baptized, none of that stuff whatsoever. In my case, I am thankful for that. However, I support organized religion generally. I think a society requires it, even though it can lead to bad things. But it’s humans who do the bad things. The Goddess, as I prefer to call Her/Him, is not the culprit. One thing you wrote particularly caught my eye. Those elements you say are not found in the Bible, and I believe you. Man-made stuff. In the case of Mohammedanism, that business of keeping women covered in sheets is not found in the Koran either. The guys made that up so other guys would not see their own women. Odd things come out of organized religion. Even if you are not “religious” you should know about the great religions of the world (read Camille Paglia and her perspective on religions), because you cannot understand the history of the world without understanding the role of religion. So, your parents did not bother to pass on religious training to you, does that mean you have a right to be uninformed about religious faith the rest of your life? I hope my children do not blame me for their ignorance, but they probably will — after I am dead and cannot defend myself. A Calvinist! That’s interesting. Don’t run into many these days. 1. Where you were born. 2. What your parents’ religion is. To wit: If you were born in Mexico, odds are overwhelming that you are Catholic. If you’re born in Georgia, you’re almost surely Baptist or Methodist. If you are born in India, you’re gonna be Hindu almost certainly. They’ve run most of the Muslims out. If you’re born in the Middle East, you’re a Mohammedan. If you were born in China, you’ll be Buddhist, Taoist or a follower of Confucianism. China is a big place. If you were born in Japan, you likely believe in Shinto. And if you were born in Haiti, you believe in Catholicism or biting heads off live chickens — or both. If your parents do not subscribe to the religion of the area in which you are born — perhaps they are immigrants and/or “free thinkers” — chances are good that you’ll believe in their religion instead of the religion of your area. I call it the parental override. So, those things — earthly stuff connected to geography, i.e. religion is decided by real estate — determine for most all people what they are absolutely convinced is the Law from On High that rules the universe. And most of those belief systems come conveniently with their own Holy Book that spells out stuff you should do — or else. In spite of being born in Georgia, I had non-church parents, so that is what I became and remain to this day, another example of this phenomenon. However, I support organized religion. It keeps most people in line, and I like that. Godless places are very bad places to live. We’re seeing that more and more in the United States, of course. P.S. : Ahhh, on the third read I see where I used “it” in the post. You are correct. No disrespect was intended. Just a grammar error. I’m leaving it because if I correct it, this element of the comments will make no sense. Uh, I have seen their women. Leave them covered. Señor Gill: Now that cannot be so. I am sure that the ladies of Mohammed are like women everywhere. Some are hot. Some are not. Sad that there were no bells ringing to announce the arrival of a new soul back in heaven. 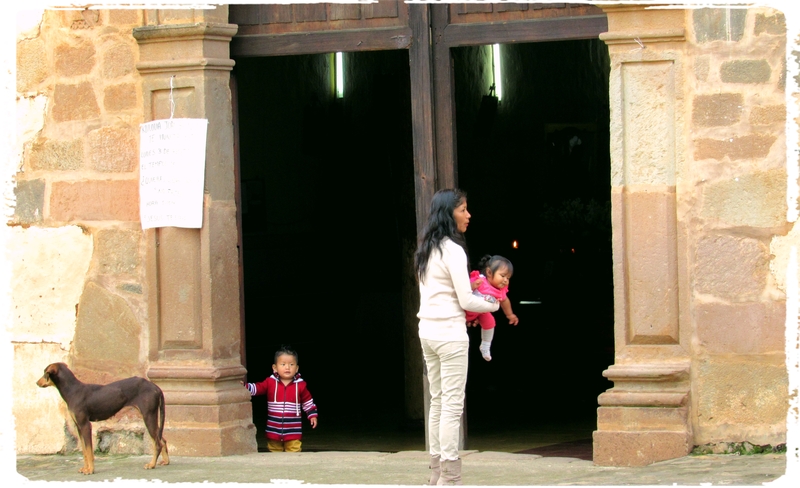 Interesting that there would be no priest at the service which only leads me to think that the baby was born to an unmarried woman….is that still a bad “thing” in Mexico? Catholics can be so self righteous (and I was of the Catholic persuasion at one time). Angeline: I imagine the church sees it as a bad thing. I also imagine it’s fairly common. However, I do not know with certainty any of that stuff. My interaction with Catholicism is restricted entirely to my sitting in their churches now and then for fun. Interesting post. Fascinating comments. I agree with Bonnie. God is in control of our salvation — as much as we try to develop doctrines to justify our own actions. For that reason, I am suspicious of most institutional religion. But it does not keep me from being involved in it. One of the contradictions in my life that I do not intend to resolve. I do know that God wants us to show the same love to our fellow men that he has shown to us. It will not earn me frequent flyer heaven points, but it will go a long way toward building his kingdom on earth. Señor Cotton: The Golden Rule is an excellent thing though it’s often quite difficult to follow. My father once told me something that stuck with me, and I’ve seen variations of it since: Trying to explain the workings of the universe is like trying to explain the internal combustion engine to a dog. I believe this to be true. It is totally beyond us even though many think we’ve got it all figured out. I cannot help but chuckle. Nevertheless, I support religion and religionists … as long as they aren’t ringing my doorbell with brochures and pamphlets.